NOTICE: Activation key must be used on a valid Steam account. Requires internet connection. About the gameNever the same game twiceYou have risen to lead an up and coming civilization in magical land of Elemental. Your village lives in the shadow of one of the precious shards of magic. It also possesses something unique in all the world -- the Forge of the Overlord. This powerful artifact all… ows its user to craft magical items and equipment. Armed with the Forge of the Overlord, your people look to you to challenge the malevolent Sorcerer King, a being who has devastated the land and filled it with ruins and minions. Unknownst to him, you have learned the Spell of Ascension that will allow you to channel the magic of the shards and enable you to ascend to a being of nearly unlimited power who can set the world free (or destroy it). But you are not alone. Other civilizations are rising while the Sorcerer King schemes in his distant fortress. They too have their own plans…	Key FeaturesA rich world to explore Choose from one of eight civilizations to play as including the Endless Night, The Dwarves of the Frozen Realm and the Men of Altar Discover ancient dungeons, lost temples, haunted villages and more that lead to adventures with danger and treasure Use the included map editor to create your own unique world or let the game randomly generate one for endless replayabilityA Deep history to expand into Meet other races to ally with or go to war against Put down criminal organizations, liberate oppressed towns and discover new lands to found new cities in Research new spells, learn new skills, and craft new itemsA vast empire to exploit Use magic to raise mountains or create icy plains Harvest metal, crystal, horses and other resources to build ever more powerful forces Enlist the aid of powerful champions and terrible demigods to do your biddingA myriad of foes to exterminate Use your magic to charge Curgen's Bane to transform you into a god Gather allies and assault the Sorcerer King in his fortress Destroy the demigods of Elemental with your righteous mightBeyond the game Construct new worlds with the included map editor to create your own land to conquer Design new quests with the quest editor to create your own story or recreate your favorite RPGs of the past Share your maps and quests with others with the integrated Steam Workshop library	System Requirements Windows - Minimum Operating system: Windows 10 / 8.1 / 7 SP1 / Vista SP2 Processor: 2.2 GHz Dual Core Processor Memory: 2 GB Hard disk space: 5 GB Video: 512 MB DirectX 9.0c Compliant Video Card Sound: DirectX Compatible Sound Card DirectX®: 9.0c Copyright © 2016 Stardock Entertainment. 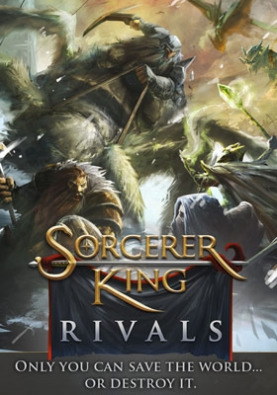 Sorcerer King and Sorcerer King: Rivals are trademarks of Stardock Entertainment. All rights reserved.